It’s time to get outside and time to start my Youtube channel! Yes yes you heard me! I decided to start sharing more workouts, recipes and other cool stuffs! 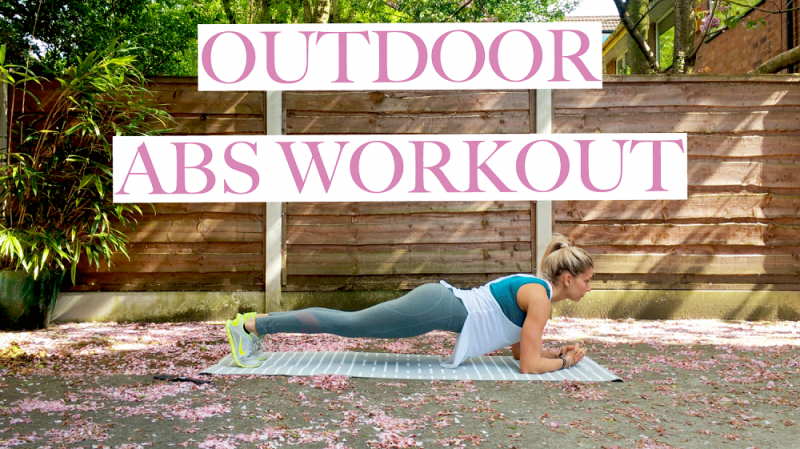 And we start today with an outdoor abs workout! So come on, just grab a mat or towel and if you lucky lay down on your grass… if not do like me and do it on hard floor. 😉 Let’s begin this abs workout! Start by waking your body up a bit with few stretches and jumps. This workout is a circuit, you do those 6 exercises in a row… that’s one series. You should do a total of 4 series. Lay down on your mat, everything flat,your hands on your sides and legs against one another. Now raise them up in a 90° angle. Try to keep them straight as much as you can. If you can’t it’s okay, just bend them a little bit (not too much!!). Also unlike what I do in the video you need to point your toes. Try to not go too fast and feel the contraction in your core. If you are struggling you can put your hands under your bum to lift it a bit which can help if your back hurts. This is a form of crunch! Lay down on your mate and bend your legs. Let a space between your two legs for your hands to be able to come through. Now put your hands together in front of you and begin your crunch up up up, now your hands goes between your legs and touches the floor. Go back to the start position slowly. This is important to control your movement here and have a good form. Ahahah I absolutely don’t know the name of this exercise! Sooooo what?! Those are killers but they are really good to build a strong core. Keep your back straight for this exercise like on the video. If you can’t do 20 I completely understand and try to aim for 15. Oh I love this exercises! It really work deeply your core if you do it right. Lay down legs and arms apart, lift your right leg and left arm and make them touch above your stomach. Do the same with your left leg and right hand. When you watch that one, you might think ohhhhh that’s easy… well watch again! This exercise is really good for multiple part of your body so I recommend it a lot! Stand straight, then put your hand on the ground and start to walk towards the front of your mat with your hands… without moving your feet. Then come back to the starting position walking with your hands backwards. There are few variations in the video if you want to check and increase the difficulty. Are you done with your abs workout? If you’ve done the 4 series congratulation to you!! I’m very proud! You can try to do this 1 or 2 a week to start with depending on your objective. And don’t forget it’s all about the control and the sensations that your body feels. Sometimes you will do the exercises a bit differently and feel it more… That’s what’s important! Previous Post Why should Women take protein shake ? Next Post The Best Chia Seeds Pudding Recipe !